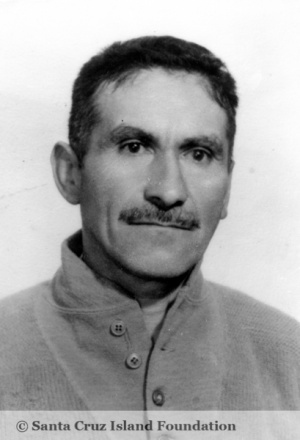 VELASQUEZ, Samuel (1909-1962), native of Vera Cruz, Mexico who went to work on Santa Cruz Island June 17, 1957. 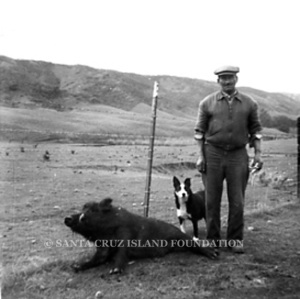 He was killed on the island five years later on June 4, 1962 at age 53 when he accidentally drove a truck off the road between Johnson's and Pozo. His son was allegedly teaching him how to drive. The truck can still be found in the canyon where it landed. 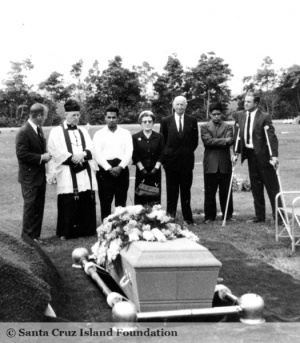 Attending: Carey Stanton, priest, Manuel Velazquez (son), Evelyn Stanton, E. L. Stanton, Jose Rivera, Henry Duffield. This page was last edited on 6 August 2015, at 09:58.